Tynelle's 20.08 mark, demolished Barton County's Ariel Brooks' 19.55m championships mark that stood since 2004. She extended the mark to 20.28 in the third round but, still was not done. The sophomore had a throw of 19.82m in the fifth round before unleashing a 20.91m Jr. College record on her final attempt. 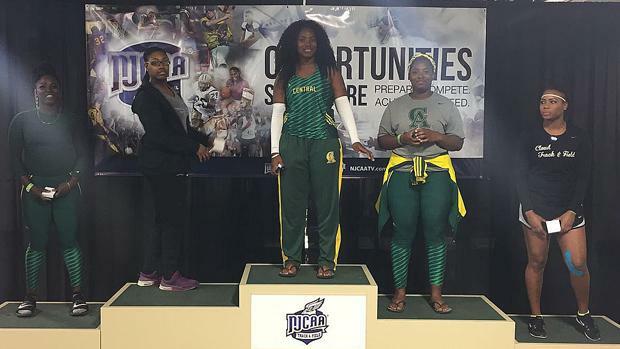 "I enjoyed competing with everyone and I never let my guard down, because I knew that anyone could pop a big throw at anytime," Tynelle said. "I've been trying to get the record since the beginning of the season but, it wasn't coming together. I think the key to my success was just being relaxed and my technique coming together at the right place." She said the 20.91m throw came as a surprise. "It was close to 21," she noted. "When I saw the throw land I started crying because I knew it was big. I was very happy." Tynelle said when Trevia opened with 19.08 to take the lead, she was excited for her as it increased her personal best from 18.28m. "The main aim was just to keep her relaxed so she could have a bigger throw," she said. At World's Last Chance meet in New York, Tahesia Harrigan-Scott won the 60m dash in a season's best of 7.20 seconds, followed by Karene King in 7.53. Harrigan-Scott ran 7.33 in the prelims and King, 7.58. Tarika "Tinker Bell" Moses ran the third best 400m in or outdoors when she placed second in 53.76 seconds.